LGBT | Davina Kotulski, Ph.D. I haven’t been ready to talk about Orlando until now. I’ve been reflecting deeply on this and wasn’t ready to jump into the mix with my opinion. The shooting that took place at The Pulse was chilling, gruesome, shocking, and heart-breaking. That morning when I read about it on-line I immediately went into prayer for the people who died and for protection for all who were attending the LGBTQ Pride events in Los Angeles. I feared a copy cat event. I called my friends in Florida to make sure they were still alive. While my friends aren’t bar flies, many LGBTQ people go out to clubs once a year during Pride. I also imagined the large clubs I’ve attended and the thought of a scenario like that passed through my mind. I remembered last year dancing in a huge packed club in Denver and how crazy it would’ve been if someone started shooting people. It was a horrible thought. It took me back to 2009 when I was getting serious death threats from a deranged homophobe. It was the year my former wife and I were grand marshals for the SF Pride Parade and we were riding in an open car down the parade route. I was afraid in the days leading up to the event bit I just had to surrender to the fact that if it was my time to go there was nothing I could do. I wasn’t going to hide or stay home. Gratefully nothing happened. I thought about the bomb threats and crazy people that showed up at marriage equality events and rallies. One time I had to quietly slip away and notify a cop. Another time, a crazy guy grabbed a microphone and once we had to stop our March 4th rally for over an hour because of a bomb threat. That happened with SF Pride too. back then I had to look past the threats and stay focused on the importance of being out and proud. The others did too. Feel the fear and do it anyway, that’s the definition of courage. In some ways, I went numb after hearing about Orlando. I couldn’t allow myself to feel the grief of knowing LGBTQ people were being hunted by a deeply emotionally disturbed killer. Then I learned he was a self-hating gay or bisexual man and it made sense while showing us how complicated homophobia is. Internalized homophobia hurts everyone! That’s why in addition to my marriage equality work, I started doing How Come Out of the Closet and Into Your Power programs to help people move through their internalized homophobia and to help family members of LGBTQ people come out as allies. I even led a one day workshop called Fearless Queerness to help people be their authentic selves. It was so much fun! I think an added layer of sadness for me was the fact that so many family members were learning that their children, brothers, sisters, etc. were LGBT after they were murdered for being LGBT. Many died never sharing their truth with the world. What if the shooter had been out and proud? What if had learned to love and accept himself? 49 people would still be alive today and contributing to our society. It’s heartbreaking! 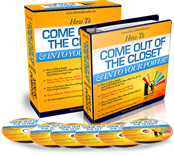 My How to Come Out of the Closet and Into Your Power 8 hour Audio Program can help anyone step more fully out of the closet, out of the fear and into being courageously in their power! I attended the Orlando Vigil in Los Angeles. Lady Gaga began reading the names of the first 15 people who died. Every name read left me feeling the void of that person’s life, though also knowing that because of their sacrifice their legacy would live on. After the rally, me and Diana ran into my friends, Geoff and Peter who I worked with for more than a decade on marriage equality. When I hugged Geoff I was immediately overwhelmed by sadness, that was when I felt how personal this attack was, that someone from my community could be gunned down for being who they are. It brought the attack home. We resolved that we will continue our commitment to creating a world that is safe for all LGBTQ people to be who they are and to love who they love. I hope you will make that commitment too. If you feel you, or someone you love, could benefit from more support please contact me. You’ll also find information about upcoming events, groups, and classes with me below and on the side of this e-mail. Wishing you freedom from fear and love for all!